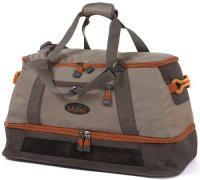 Wader bag and wading tote bag selection. Small, medium and large waterproof and breathable bags for chest waders. After the alarm goes off in absolute darkness..... grab a mug of coffee, then your gear bag by the door and step into the wild. Its comforting to know youll have everything you need as the Flattops Wader Duffel has a purposeful and ventilated lower storage compartment for wet waders and boots, while the upper storage compartment is perfect for vests, packs, clothing, and the not-to-forget snacks. This is the perfect companion to the Dakota Rod and Reel Case, so you can focus on getting out the door rather than wondering where you put that other boot. 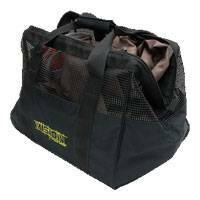 Vision's innovative wader bag is combined with a car seat cover which can be used when changing into waders. The mesh made top enables your wet waders and shoes to dry out while stored in the bag. An innovative solution for storing and transporting chest waders or wet clothing. The Wychwood Wader Bag allows for easy packing away using a large front mesh panel and Duraflex clips. Transportation is made easy through the unique, registered folding design, whilst the correct storage and drying processes are also easily achieved through the unique Drop'N'Dry system. When arriving back home simply hang the Waderbag up to dry using cordura hangers and eyelets, allowing the large ventilating, mesh panels to dry your waders naturally, limiting mould growth and preventing damage. The Waderbag also features a stand-on neoprene mat for changing on the bank preventing wet socks, valuables pockets for safe-keeping when in the water and finally a self-drying wader boot compartment for wet wading boots.  Unique no fuss DropDry system.  Safe storage for expensive waders.  1680D high quality waterproof material.  Neoprene changing mat to prevent wet socks.  Mesh pockets for tackle, socks, wader repair etc.  Self-drying wader boot compartment.  60 x 540 x 560mm. The Wychwood Boot Bag is a high quality walking or wading boot bag made from a waterproof 1680D material featuring an easy change neoprene mat for standing on when changing footwear outdoors. A safe and hygienic way of transporting dirty footwear, created using the unique Drop'n'Dry system, which allows the footwear to conveniently dry inside the Boot Bag when stored. A simple no-fuss solution to storing dirty footwear.  Safe storage for walking boots or wading boots.  Protects furniture against dirt whilst in transit.  Soft neoprene change mat.  Rubber mesh drying vents. The return of some old Snowbee favourites! 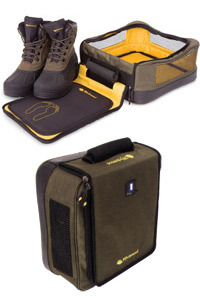 Their famous Chest Wader Bag has often been copied, but never bettered. 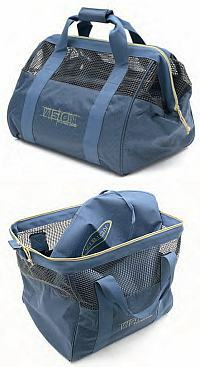 This ingenious bag, is a must for any fishing trip, as it will swallow chest waders, boots, clothing and tackle. A mesh panel in the lid allows damp waders to dry naturally. On the side of the bag is a roll-out, waterproof changing mat, so you can step right out of your waders and onto a dry surface, to avoid soggy socks, or punctures. The adjustable shoulder strap has reversed clips, so that it can be used as a Wading Belt. A nylon divider flap inside the bag, separates muddy wading boots from your waders or jacket. The perfect bag for waders and boots. Rubber mesh side panels allow for cross ventilation to dry gear. Carry handles with padded handle wrap. Highly durable base fabric. Adjustable and removable shoulder strap with perforated pad for comfort. 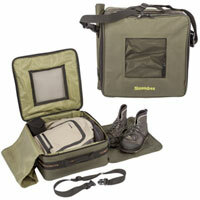 Will accommodate wader and up to a size 15 wading boot. In slate blue. 19½"L x 12¾"W x 10½"H; 2,610 cu. in. Weight: 1 lb. 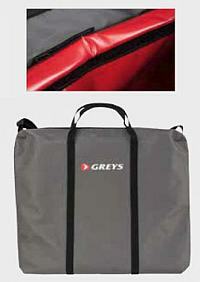 Innovative wader bag is combined with a car seat cover, which can be also used when changing into waders. 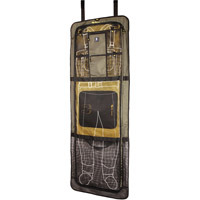 The mesh made top enables your wet waders and shoes to dry while stored in the bag. Colour Black. Measures: 17.5 by 11.8 by 12.6 overall.